Home > Ask Our Experts > Caving and Confined Space Training: What is Best Practice? 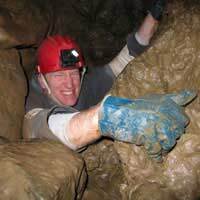 My son went caving with the scouts and on the trip there were 3 boys and the scout leader. The hole they went in was a shaft with a ladder about 20' deep that led to the cave. The scouts and leader were all on a rope, is this good practice? I'm a bit concerned. I work in the water industry and I'm 'confined space' trained is caving the same? As caves are inhospitable places fraught with inherent dangers for explorers, from flooding and falling to hypothermia and losing your way, it is natural to be concerned whether your son’s scouting caving expedition is being undertaken with due care for the many risks involved. For something so potentially treacherous naturally there must be some kind of safety standards in place but as a relatively unknown activity, what is “good practice”? Although not a particularly technical endeavour – or one that requires above average levels of strength and fitness - caving does demand certain basic preparation from your son’s scout group. Firstly the leader of the group should be an experienced caver, fully conversant in the emergency procedures, and with a familiarity of the caverns being explored. Their team should be made up of between 4 and around 6 members. Secondly the team should be properly equipped. This means a pair of sturdy boots or wellies, layers of old warm clothes, an oversuit (such as a boiler suit), a helmet with lamp, a spare torch, safety harnesses, rope, ladders and climbing gear. Any expedition should be fitting with the level of experience of its participants. Caving is not about pushing yourself to the limits but staying within them. With this in mind, any first time explorations - such as that undertaken by your son’s scout group - should be relatively undemanding in order to ease one into this strange new underground world. This would mean a predominantly horizontal system of caverns with no ‘squeezes’ (small gaps to crawl through). With this in mind you are right to be concerned by an expedition that begins with a 20' drop. Typically systems involving drops – or ‘pitches’ in the caving parlance - are reserved for those cavers who have acclimatised to the caverns and want to take their adventures a stage further. However it may be that only the entrance to the cave your son’s group explored involved a drop, as this is a fairly common means of entry. Ascending and descending vertical sections using either ladders or Single Rope Technique (SRT) is one area of caving that demands some technical skills training on the surface beforehand. This training will teach everything from the basics of putting on a harness, to rescuing a fellow caver who has fallen unconscious at the bottom of a pitch. So in answer to you question of whether it is good practice for the scout group to negotiate a pitch using a rope, yes it is standard just as long all participants have been well trained in the art of SRT beforehand (Single Rope Technique is a set of methods that enable the climber to descend and ascend on a single rope). Confined space training is, however, not required with caving. Those people who suffer from claustrophobia are advised not to take part because they wouldn’t enjoy it, but by and large unless they want to conquer their fear, very few would even consider it anyway.